Hola! You made it to Part 3, wherein I detail some of the discoveries, pitfalls and trials of implementing my standalone lava lamp software running in Raspbian. Part 1 - The inspiration and initial setup. Part 2 - The physical build. 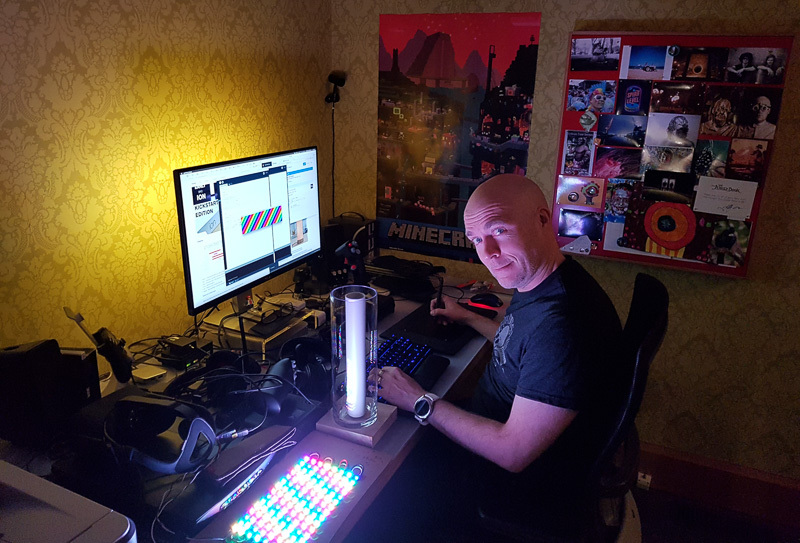 So, with the physical build complete [and having made my choices concerning buttons and lights], it was time to delve into setting up how the software driving the lamp worked ie: how it behaves when you turn it on and switch modes. I won't cover everything in absolute detail as that'd be boring, but I will link to the key places I found what I needed and discuss what I got working. 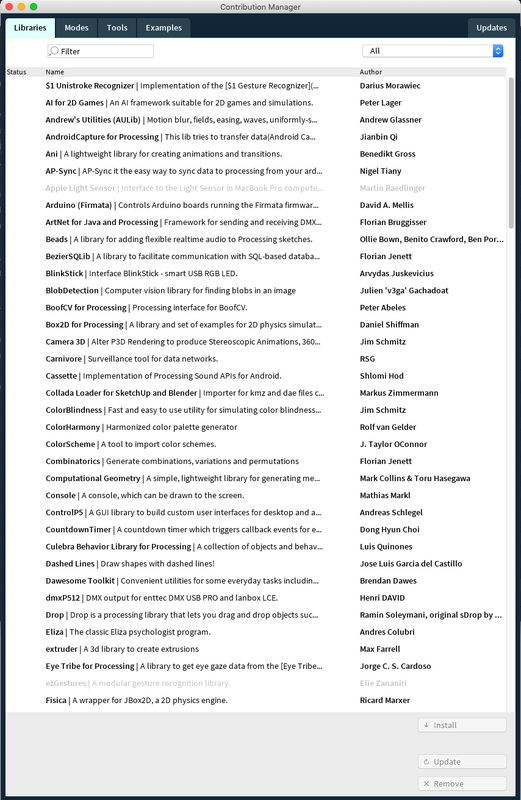 "By submitting Content to OpenProcessing for inclusion on your account, you grant anyone Creative Commons license to reproduce, modify, adapt and publish the Content as defined by the license. If you delete Content, Wiredpieces Inc. will use reasonable efforts to remove it from the Website, but you acknowledge that caching or references to the Content may not be made immediately unavailable." This meant I could openly reuse and adapt existing sketches and techniques there and modify them to run on my lamp. This led to many evenings of fun discoveries like this, and this which became modes I could incorporate into my lamp like such and so on. 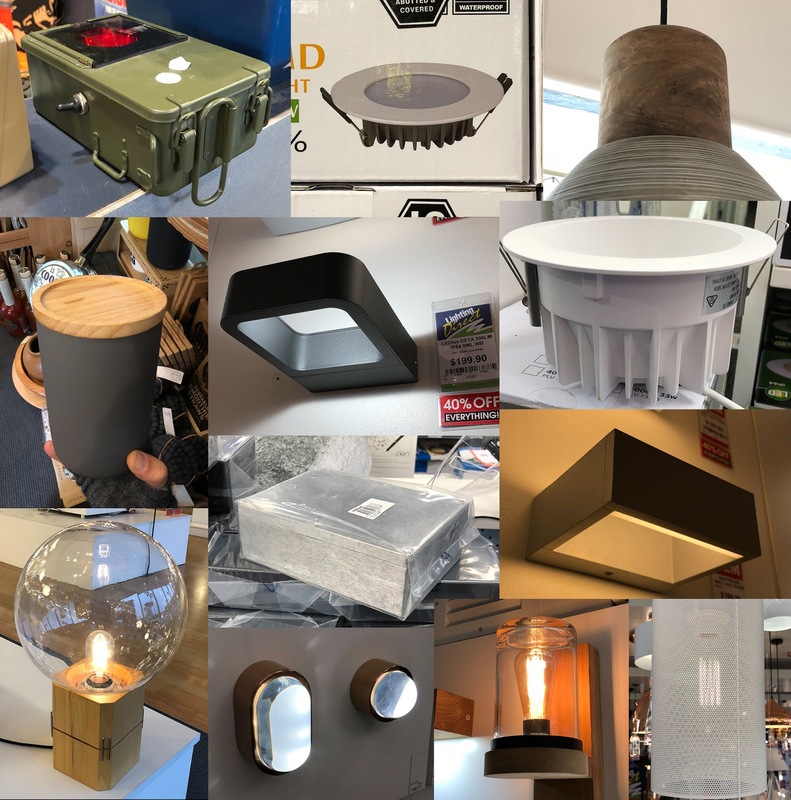 I already had a long list of things I wanted the lamp to do, but I was quickly adding new ideas I hadn't originally considered. WIN! Some of the best modes remain modified versions of the test sketches that come with the fadeCandy codebase created by Micah Elizabeth Scott. I've yet to top those in terms of beauty, efficiency and speed. Looking at some of these libraries I was inspired to create lavalamp modes that respond to changes in the weather, things that simulate hot fluids like a *real lavalamp*, as well as respond to sounds in the environment etc. 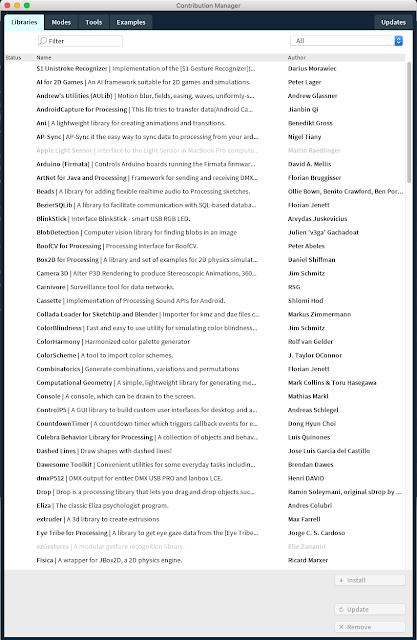 There's even standalone voice-recognition libraries that I could use to get it to switch modes when I asked it to. So many possibilities. 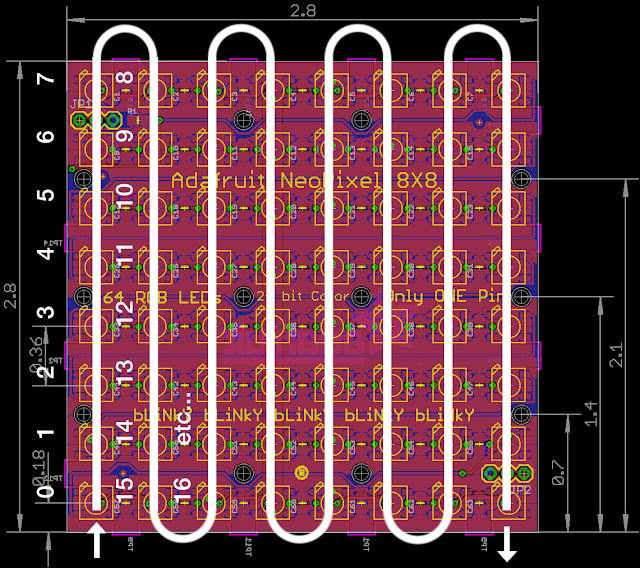 I'll put all the sketches I have and some other bits and pieces up on gitHub for anyone who wants to build something like this or simply see what I did. 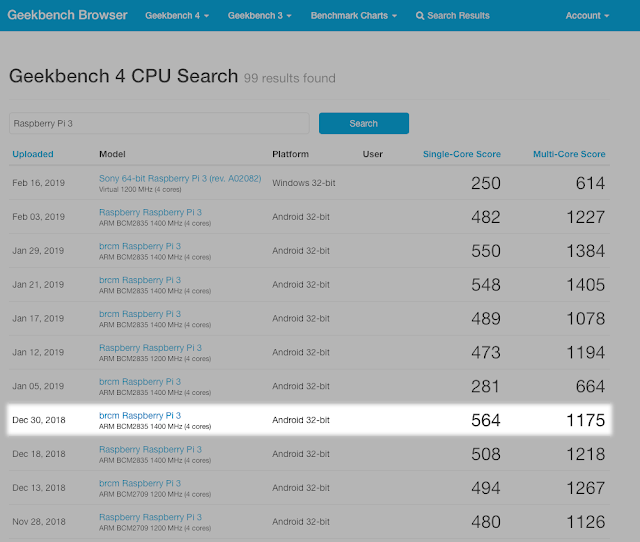 It's time to talk about Raspbian. The Raspberry Pi doesn't come with an operating system. Well, it can do, but you have to download and run it yourself from a SD card. You can run many different flavours of linux on a Raspberry Pi but the one I chose was Raspbian because it's the "official" operating system for the Pi and widely used. The first thing to do was download a copy of Raspian and flash it onto my SD card. I used an OSX utility called Etcher for this. In no time I'd booted the Raspberry Pi with everything connected and was welcomed by the Raspbian desktop and config utility. From here setup was a breeze, with one exception. My mouse pointer was lagging and jittering all over the place. A quick search on Reddit revealed that I needed to add a line to the /boot/cmdline.txt config file. This is one of the many places in linux where you can tweak settings as the computer starts up. This issue is likely one that'll be fixed in later versions of Raspbian. to /boot/cmdline.txt. There may be nothing else in that file if you're working with a fresh install where this might occur. I didn't encounter too many other issues apart from this with the exception of some wifi glitches that were fixed in a subsequent Raspbian release, so I won't cover them here. At this point, starting my Pi took about 10-15 seconds, after which it secured itself an IP address and presented itself on the network. I was able to connect to it in the OSX finder and simply drag and drop my sketches into a folder there and run them directly on the Pi by launching the pre-installed version of Processing. Which is when I first became aware of one of the chief differences between the Pi and a Mac Mini, namely CPU performance. My Mac Mini [late 2014] is a Intel Core i5 running 2 CPU cores at 2.8GHz. So it's not exactly bleeding edge but it's got enough snot to chew through a lot of Processing draw calls, specially at the resolution I'd been prototyping my sketches at ie: 400x800 etc. Particle simulations run pretty smoothly, computational fluid dynamic solves run well enough to look like fluids etc. I was able to use Processing's additional 2D and 3D acceleration frameworks to speed up some effects too. I could afford to instance a transparent circular gradient .png file as a fire particles at high enough sizes and densities to look pretty cool. The Raspberry Pi 3B+ however has a significantly smaller hardware capability. Although it's got a 1.4GHz Quad-Core ARM Cortex-A53 CPU, it's a very different CPU and draws a lot less power, creating a lot less heat and more importantly, simply doesn't crunch the same amount of Processing draw calls I was used to. 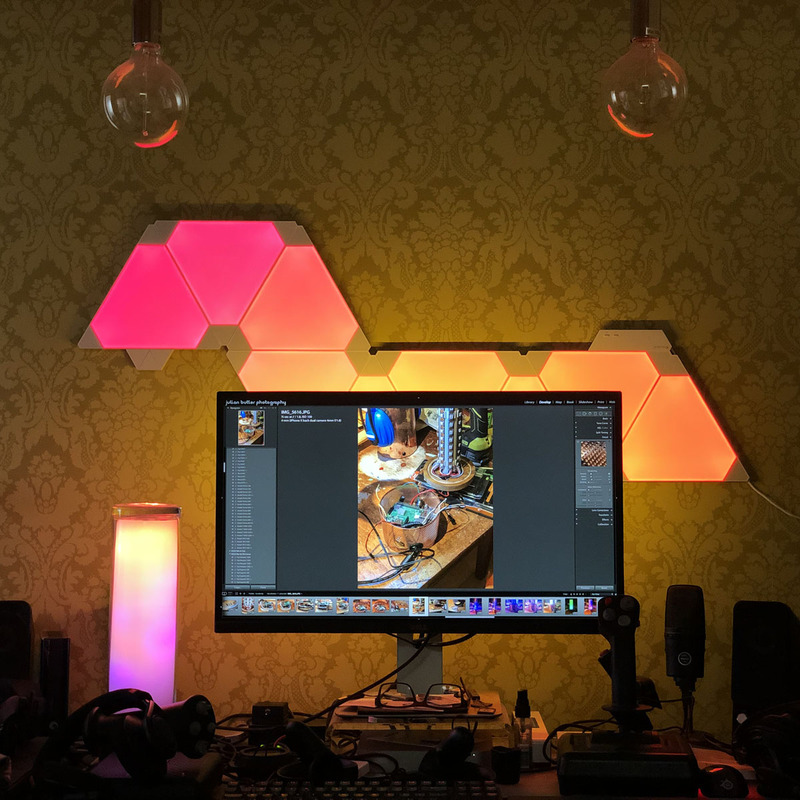 I'd been spoilt by prototyping my lavalamp modes on the Mac Mini and was forced to make some economies and trade-offs to achieve the performance that I wanted in my lamp. Disable the 2D draw support - depending on the sketch, it was adding maybe 25-30% performance gain over NOT using it. Lower the overall sketch resolution, which was ok because lets face it, technically speaking the sample resolution of the array was low to begin with. 8x15 LEDs is not exactly high-def. And 400x800px is a little rich. Sketches now became more like 100x200px, which as we know from the MegaPixel Wars in camera sensor resolutions, is a non-linear improvement. Lower the number of particles I was drawing. Change the particle itself from a transparent gradient .png file to a simple flat transparent circle() in the draw function and use other techniques to regain the softness I'd previously had. In other sketches where I was needing to draw lines or other shapes, simply lower the number of line() calls, make them fatter etc. If I needed to achieve an animated wipe or transition, I considered using a single large image and transforming it somehow, compared computing it's appearance otherwise [in fact, this is how I achieve my startup array test look]. 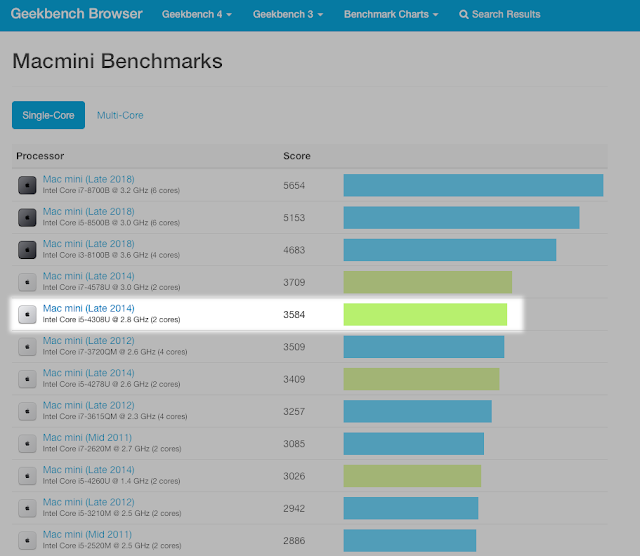 With most sketches getting one or more of the adjustments listed above, I regained about 50% of the performance I used to have on the Mac Mini, which was good enough. Some of the computational fluid dynamic sketches required deeper digging to optimise for the Pi as they had more complicated compute functions as well as requiring drawing many particles. I also found it helpful to specify a target frameRate() and work within that constraint until I'd achieved the speed and look I needed. By default I think Processing sketches will run as fast as they can - this may not be a good place to be! The look of your sketch may be affected by it's compute, so it's important to know what knobs to tweak to control appearance. Even after shrinking and optimisation, my Simple Fire sketch can consume 83.2% CPU on the Mac Mini at 30fps. Overall this phase was good. It forced me to economise and be efficient. It also made me work harder to achieve the look I was after and consider more difficult changes to some of the sketches I was working with. 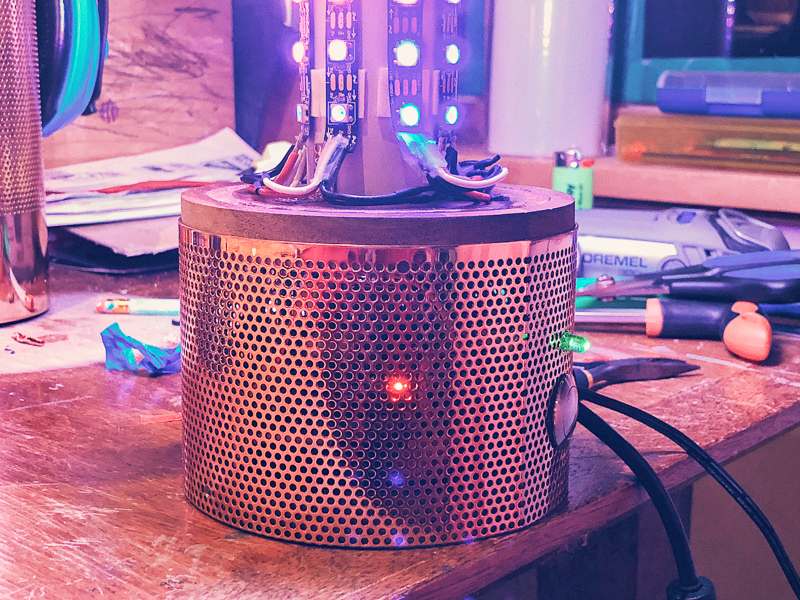 FadeCandy has a server/client architecture such that you can run the server on a main computer housed somewhere central, and then multiple small FadeCandy units can connect to that server to control LED strips where you need them. The server is very lightweight. All you really need to do is run it at startup and forget about it. Note: in the guide I just mentioned, I stopped before creating the fcserver.json config file as I am simply running one FadeCandy board and didn't need to configure addressing the 3 boards used in that example. The FadeCandy server page has some useful utilities for testing your LED strips etc and will also show you the serial number of the FadeCandy board you have once it's detected ie: plugged in via USB. 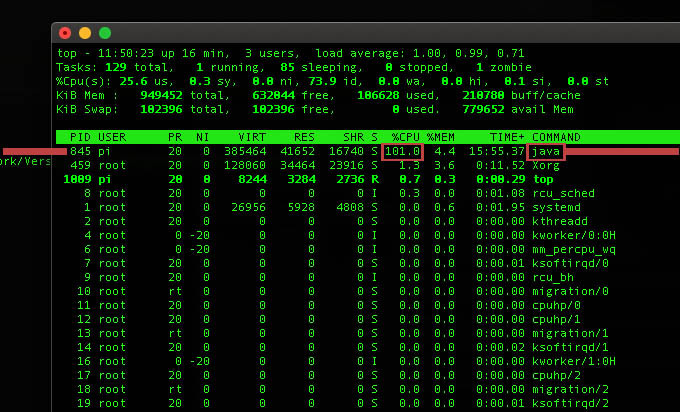 How does Processing interface with the FadeCandy server though? 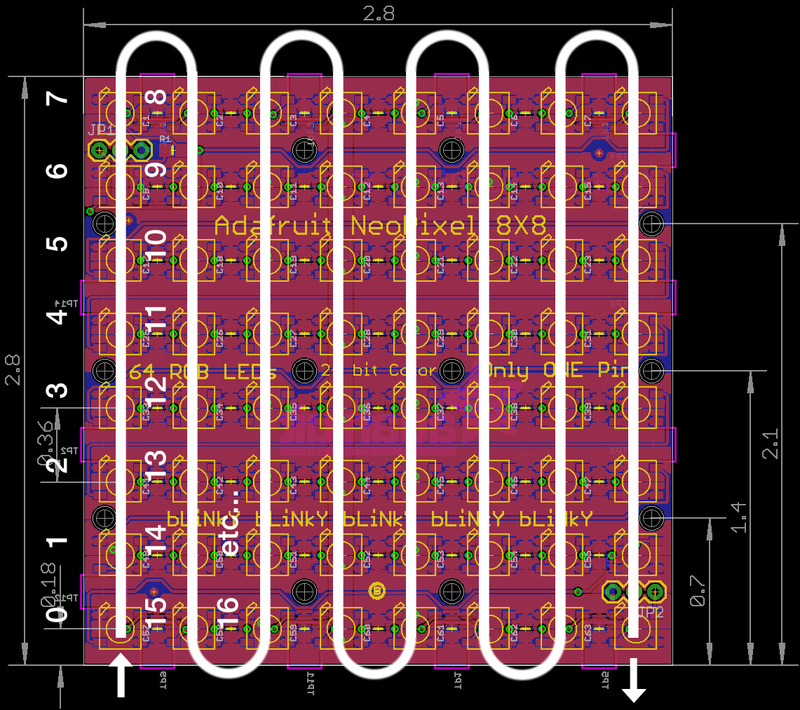 How do you even know what is being sent to your LED array from your sketch? Good question. This is where the OPC class comes in. Shipping with the FadeCandy installation comes some example files created by Micah, that contain her Open Pixel Control java class for Processing. This is a suite of methods for telling the FadeCandy server where a LED [or multiple LEDs] are positioned relative to the sketch window. It has calls that allow you to mirror your physical LED array in Processing so you can accurately gauge how to achieve the visual effects you need. 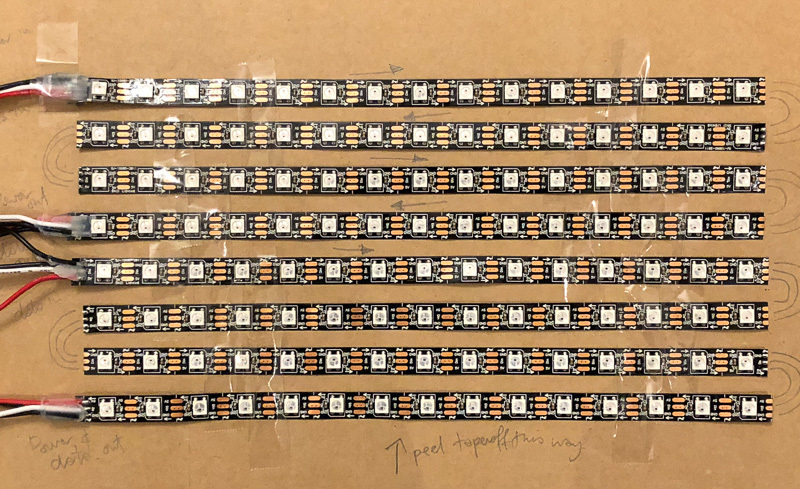 You then use calls like ledStrip() and ledGrid() to construct a sort of sample array whose points will query the colour of pixels under them and send that info per frame to the FadeCandy board over USB and then onto your actual array. 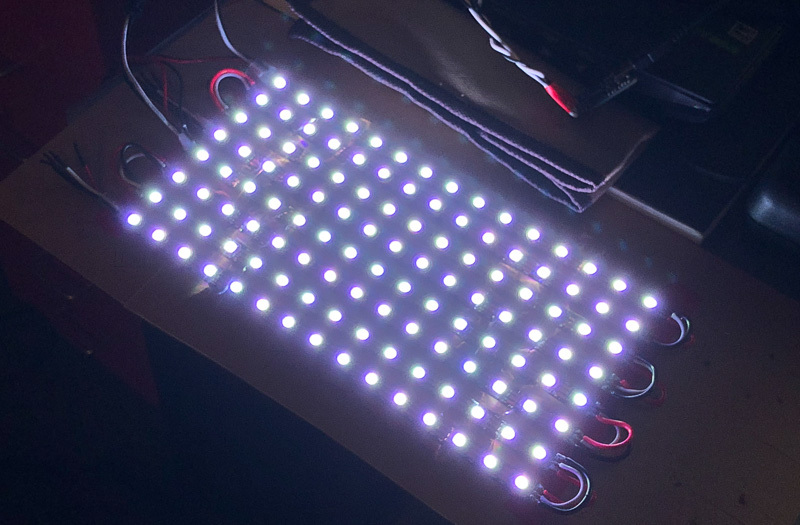 The first ledGrid() command arranges and fills the first FadeCandy output channel of 64 LEDs and the second ledGrid() call fills the second channel with the remaining LEDs. 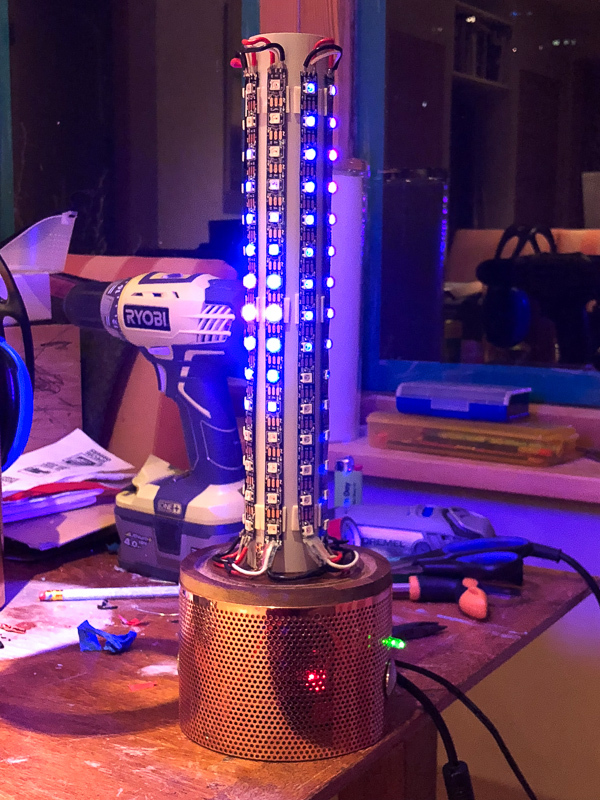 The '4.712' is the rotation amount expressed in radians required to get the sample array mapped in a vertical orientation to match my LEDs wrapped around a cylinder. On the left, Micah's wavefronts example sketch at its original size, on the right, my optimised and shrunk particle fire effect. You can see in these two sketches the result of the OPC library calls placing white dots in the sketch window that mimic the physical array of my lavalamp LED layout so I can see just where the colours of the sketch will be sampled and displayed externally. Of course, the white dots are not sampled [otherwise the LEDs would just display white! ], just the colours underneath them. So this means that you actually don't really need to run a sketch in a large window as there's a lot of wasted draw() that is not utilised. There's a lot of gaps between the dots. So, for an application like mine, I can make the sketch smaller and use a filtering function like filter(BLUR, 2) to handle smoothing the edges of moving shapes. One of the realties of using a full Linux computer [or most others for that matter] as a lighting fixture is that you can't simple unplug it when you want some peace. Computers have file systems that may be busy in the middle of writing some important information when you cut the power, and this can corrupt the file system, potentially making your computer not even start up. I had little choice but to consider making a nice way to shut the Pi down when I wanted to turn it off. And without having a mouse, keyboard and monitor connected to it, how can this be done? I needed a physical button. Well, two actually. One that could tell the Pi when to shutdown, and one to tell the Pi when to switch the current Processing sketch. 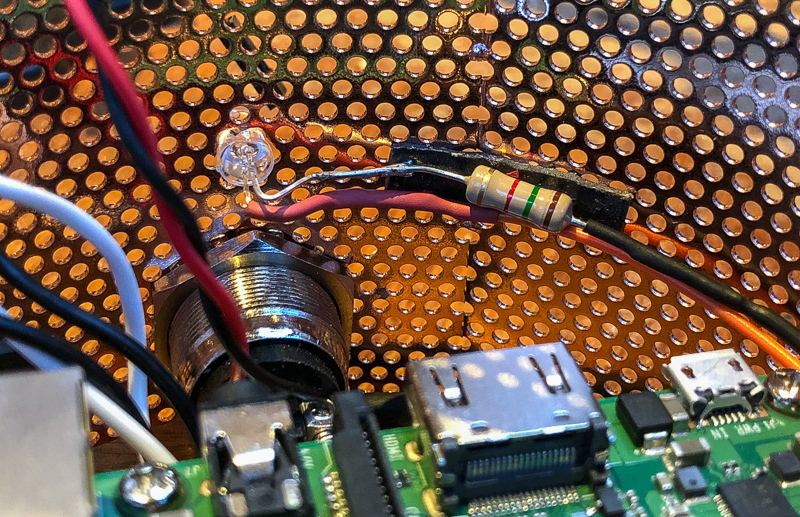 Thankfully the Pi has GPIO header pins [general purpose input/output] that permit connecting many things up etc. This means with a little browsing at your local electronics store, a simple momentary switch can be used to send these signals. GPIO pins on my Pi with two switches and a status LED connected. This link also includes the instructions for getting this small python script to run when the system starts up automatically. This is really handy and I thought I could simply reuse this script launching facility to start the python script that would listen for my second button pushes to make the lavalamp sketch change. However, this was not to be - more on that shortly. 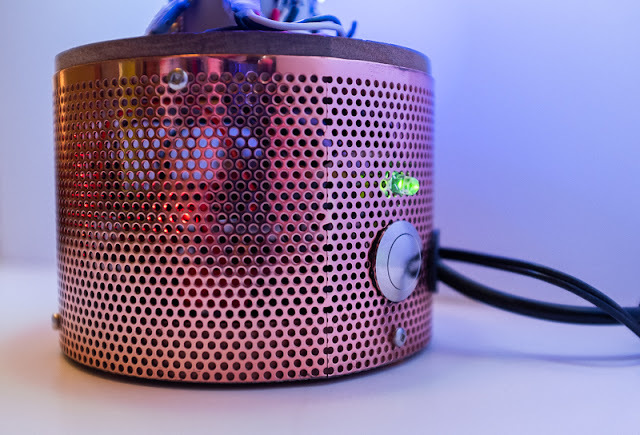 The setup in the link above requires making a small python script called listen-for-shutdown.py that uses a python GPIO library designed to sense voltage changes on GPIO pins and turn those into the system command that shuts down the Pi. You also make a shell script that will run this listening python script upon booting up the Pi. They're both small and lightweight - nice and simple. 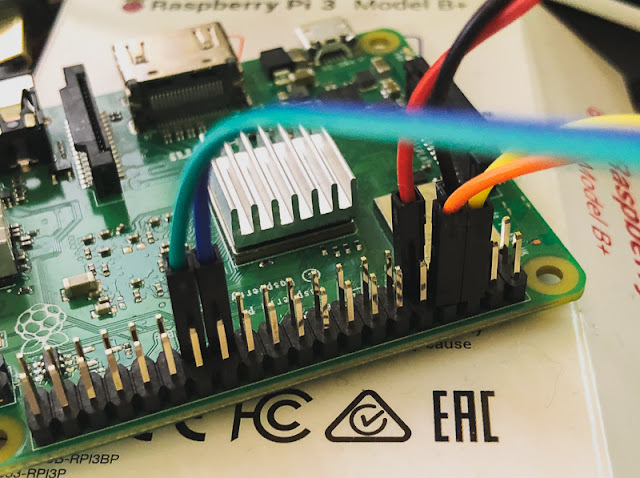 When you do turn off the Raspberry Pi, it takes about 10 seconds to halt all processes and get into a low power state where it's safe to cut the main power. Before it does that it flashes the TxD LED that is soldered onto the main board along with some other lights. More info on those lights here. It'll flash that light 10 times quickly, after which it's safe to cut the power. Here you can see on the rear of my lamp base, the extended status LED and the startup/shutdown momentary switch. I extended the last switch to the front of the housing as the sketch change switch. This was another identical momentary switch. Like I said, I thought I could simply use the same script launching system as the startup/shutdown switch, but no luck. For some reason that wouldn't work and it took some digging to discover why. I wanted to have another python script running that would again just be listening for voltage changes on another set of the GPIO pins. 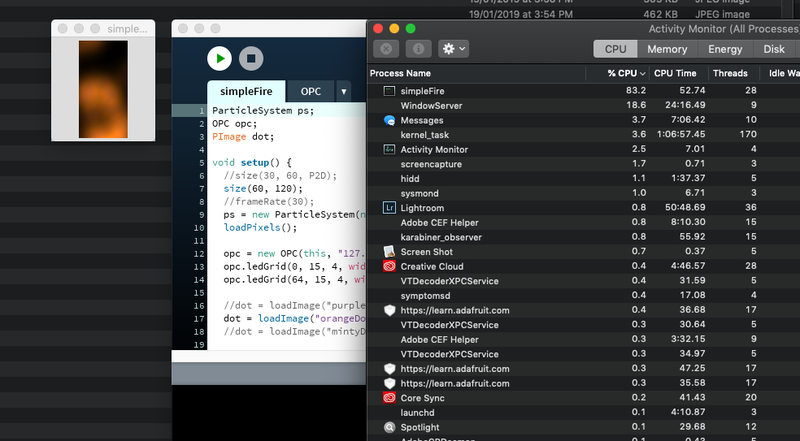 This time though, the script would kill any running sketch-related processes, iterate through the string array of available paths to sketches, select the next logical one in the list and launch it. But every time I tried it, I couldn't even get it to launch the first sketch in the array. I tried about 4 different schemes for launching python scripts at startup, making the assumption that they were all failing. It was a little infuriating. Actually what was failing was that all the script launch schemes I was using were not designed to launch interactive applications like Processing. They were designed to launch small utility scripts at different linux run-levels beneath the user-space and interactive levels where Processing could be initiated. That's why the listen-for-shutdown.py worked, because it wasn't ever trying to start a complicated graphical program, it only ever invoked the terminal shutdown command. Then I had success. It was time to flesh out the main python script for managing the sketch list and which sketch played automatically on startup. If you've used Processing on a fast computer, it might seem pretty interactive when you launch a sketch from within Processing itself. But, trying this on the Pi, I found a much longer delay when launching, like more than 5 seconds in some instances, compared to my Mac Mini's 1-2 seconds. This would be a pretty laggy experience if you pushed the button on the front of the lamp and had to wait 5 seconds before something changed. I also didn't have a way to launch a Processing sketch from within the program interface via Python, so I would have had to write some master framework within one main sketch that contained all the sketches. That would become onerous to compile and add new modes to. Processing offers a pre-compliation option where you can pack a sketch down into a standalone unix executable file compatible with your platform - in this case the Pi. 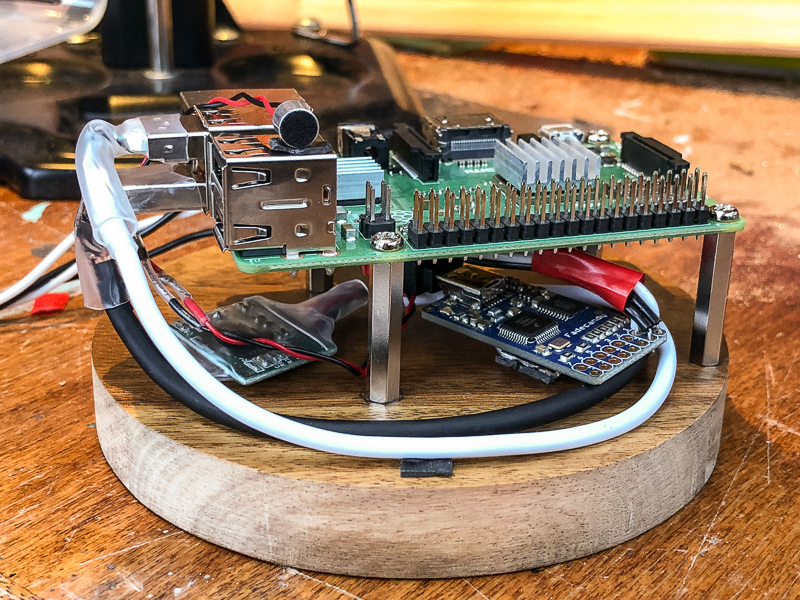 When I tried this I discovered not only does it start up much faster on the Pi, but that I can control the launching of the sketch from the command line via Python. Success! By using the good old 'top' command while a pre-compiled sketch is running, I could see at a glance that the main CPU hog is java and also that there were no other java processes currently occurring. This mean that to stop my sketch immediately I can simply execute the 'killall java' command to nuke it. This is a bit like using a hammer to squash a fly I realise, but as this Pi was simply devoted to being my lavalamp and shouldn't be running any other java processes, it's fine to use this method. It's pretty simple, and I'm sure someone reading it will find flaws and ways I could do it better. 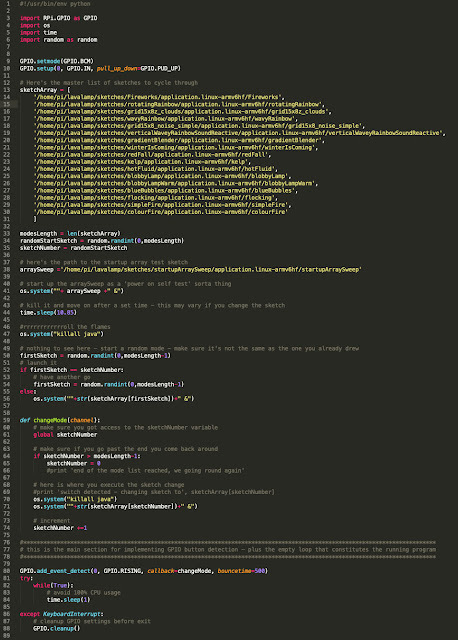 With most coding things there's always a better way. Should you want to use what I've made you can find this script and all the sketches in the gitHub repo: https://github.com/JRButler/Digital-lava-lamp You're welcome to take it and modify it to suit your requirements etc. 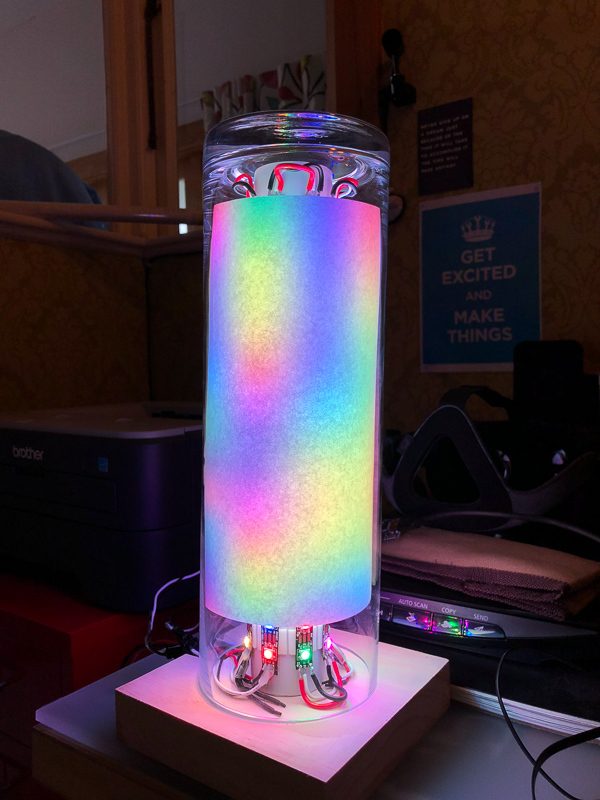 Have it serve a webpage over the local network so guests could control the lamp from their phone via animated gif buttons showing the different modes. Employ a standalone voice recognition package to control the modes. 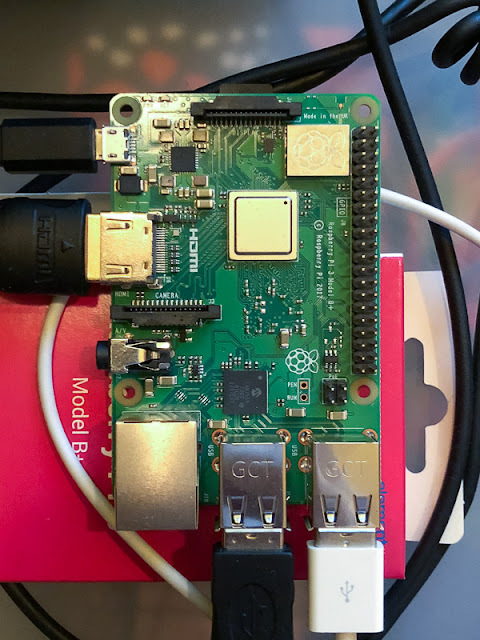 Run HomeBridge on the Pi to interface with some HomeKit devices via voice control. Make more sketches that interact or reflect the status of other things ie: IFTTT integration. Anyway, that's about it! Thanks for reading. Ok, welcome back. Last we left off I'd managed to get LED array wired up, correctly oriented with the final vertical grid arrangement, and playing sketches while connected to my mac. 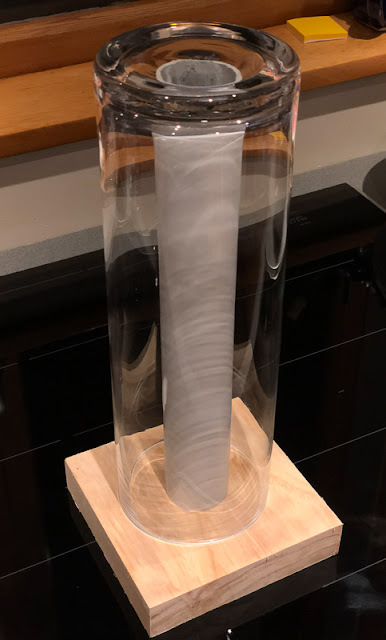 It was time to get it wrapped around the central PVC cylinder and into the upside down vase on a temporary wooden base while I figured out what the diffuser solution would be. If you haven't already seen it, here's Part 1. I decided to rule evenly spaced lines along the length of the PVC tube as a guide to make sure that I placed the LED strips in the right spots. I really wanted them evenly distributed. 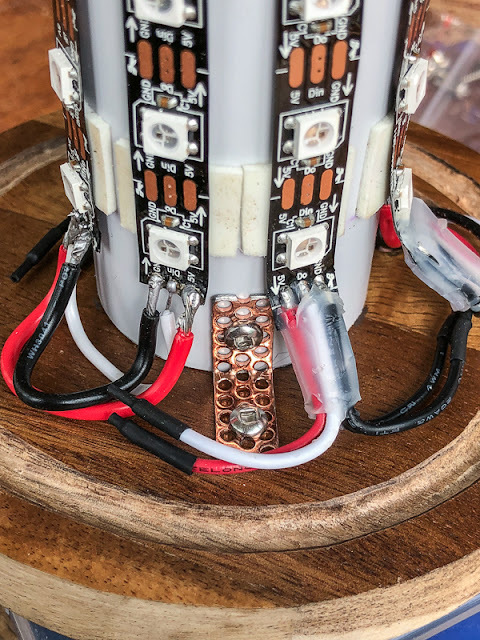 I also thought that due to the fragility of the strips themselves, that I'd use 3M double sided tape pads instead of hot glue to stick them to the cylinder. The LEDs have the potential to heat up which might have caused the glue to fail. I carved a temporary channel for the power and data wiring to pass out underneath the edge of the vase and just sat the glass instead of securing it. This allowed me to get a sense of the space I had to work with and what other considerations to make when building the final base. 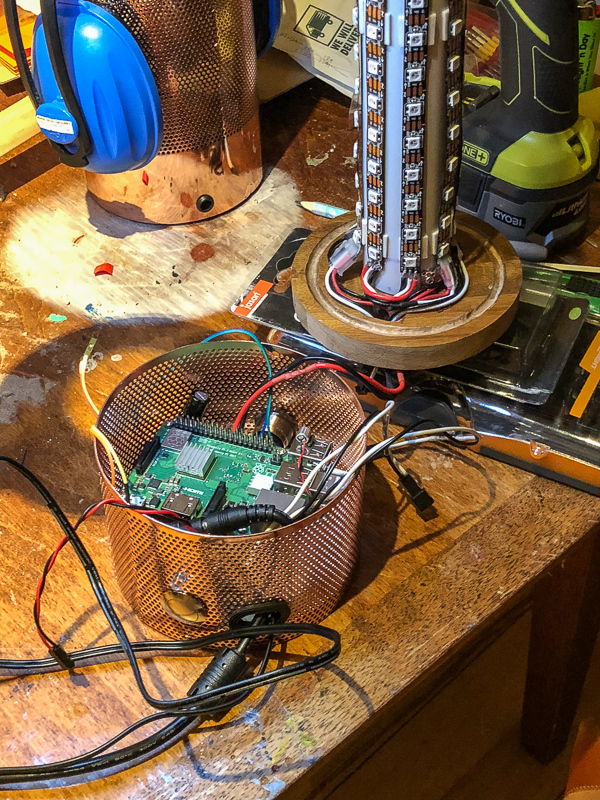 Starting to look like something Tony Stark might have on his desk. So this is a good spot to be in. I can prototype sketches to run and the array is in its final configuration pointed in the right direction. Now to test diffuser materials. 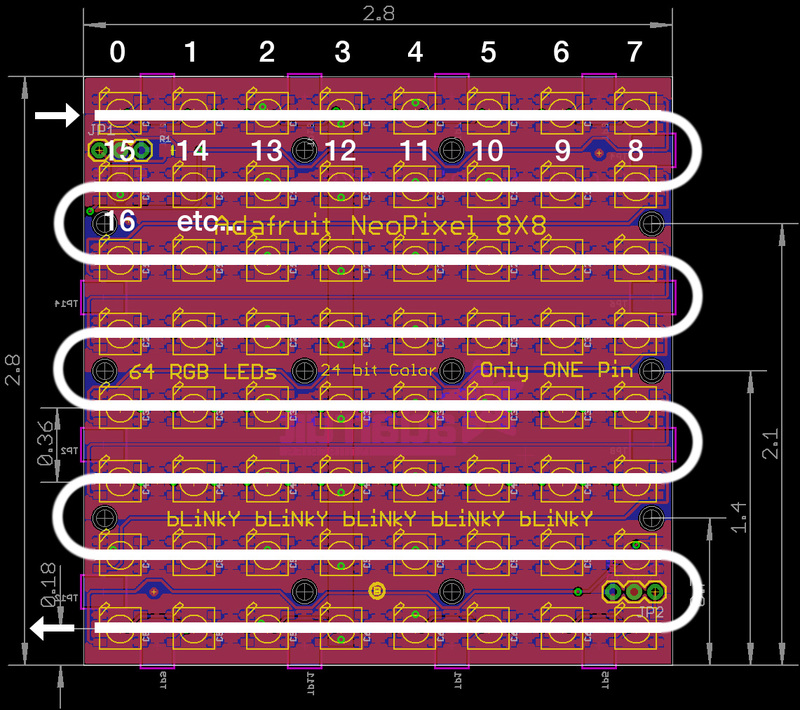 You can see in the top row that the LEDs are far too individually visible with the first material. And even two sheets weren't enough to give the right effect. However the second material worked better, and after doubling it to two sheets thick it gave exactly what I wanted. None of the individual LEDs were really visible on their own and any patterns effectively blended nicely to produce smooth gradations of colour. Testing it in the dark with a particle simulation yielded nice soft shadows and a warm campfire effect. Shooting these clips with my iPhone, I began to confront the exposure issues that make shooting bright lights in dark places a bit tricky. 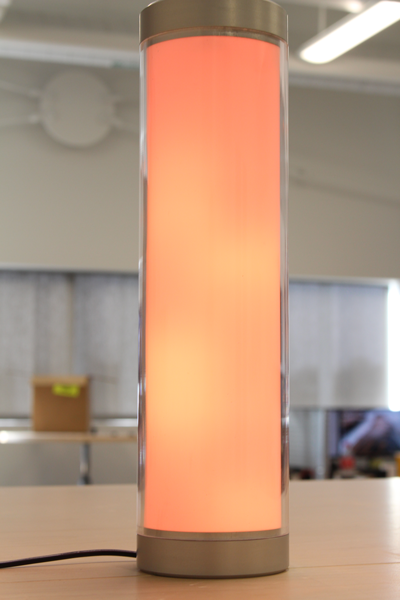 It's really hard to get a sense of the right colours the lamp is capable of via digital cameras. What seems burnt out white at the bottom of the fire in the GIF above is actually really nice on the eyes. However, later I realised shooting under-exposed with a larger sensor would produce far better results. More on that later. So, it was about at this point I started considering a couple of things. 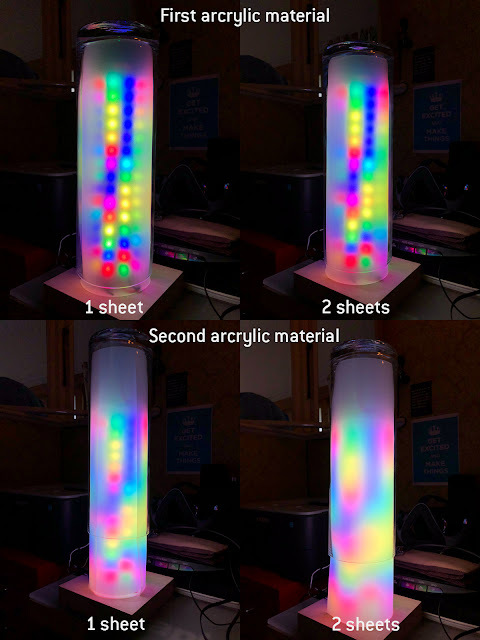 1: What is the final form of the base going to be, and 2: I wanted to put this somewhere else in the house and NOT have to have it connected to a computer via USB the whole time. This meant I needed to choose a small form-factor stand-alone computing platform that fits in the base I design, and can run the Fadecandy server plus compute the processing sketches that power the lamp. 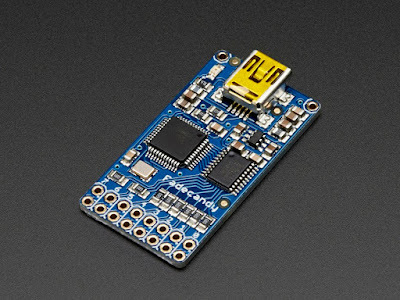 Now, having chosen the Fadecandy board to control the lights, the choice of platform is reasonable [OSX, Windows, Raspberry Pi and Linux] but does NOT include Arduino. In fact one of the reasons Fadecandy exists is to do serial computation at a rate that most Arduino boards cannot. So the only other readily available small form-factor platform is Raspberry Pi. It's also one I have a shot at doing more complicated coding and setup in due to it's embedded Python support. There ARE more high-end small form-factor platforms out there ie take a look at https://www.hardkernel.com for more. 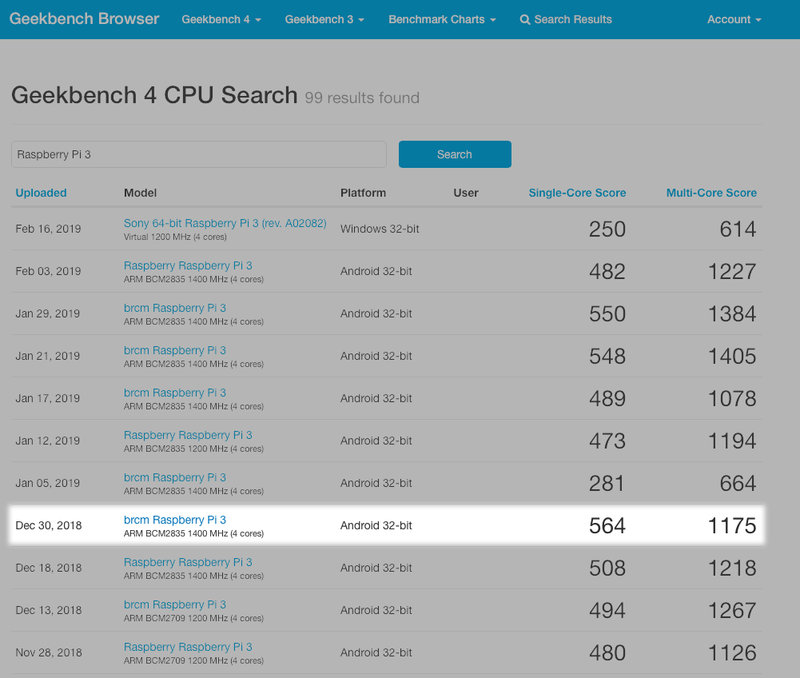 AND those platforms offer potentially much more CPU power for computing sketches at a rate similar to my mac mini. But they cost more, need to be shipped internationally, require more cooling etc. Plus I could go buy a Raspberry Pi locally and start messing with it. 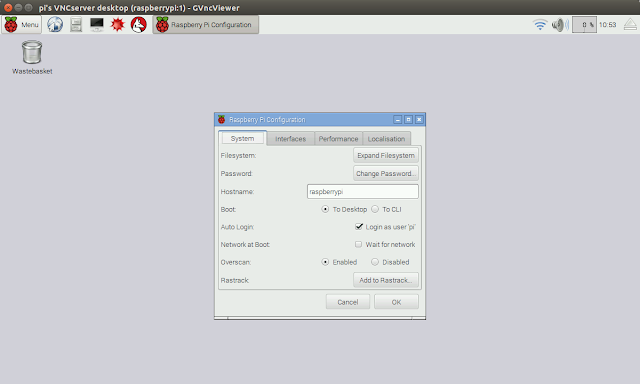 "Python and C both perform quite well on the Raspberry Pi. An expert programmer could make this a self-contained system, not reliant on a networked computer to drive the animation." Now, that's what I needed to do. 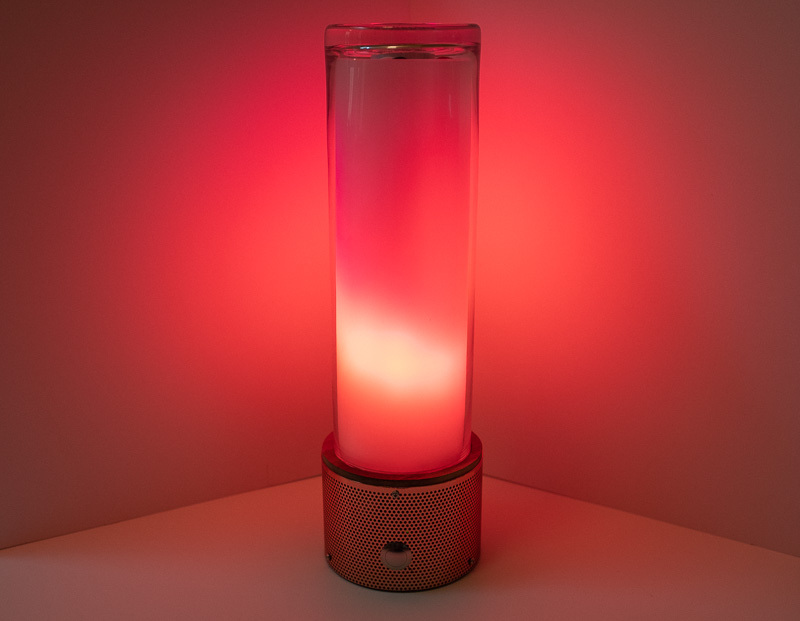 I wanted a fully standalone lamp with a button on the front to change sketches and maybe a knob to adjust a parameter in the currently playing mode etc? And the Raspberry Pi is available on the local network via wifi, so what about serving a webpage with animated GIF buttons for the different modes so guests can change it? Whoah, slow down there dude, you don't even have a Pi yet. Ok, time to fix that. Raspberry Pi Model 3 B+. NZ$60. A full quad-core linux computer you can fit in a pack of playing cards ... well, almost. It was pretty cool to unbox this, plug it into my monitor, give it a mouse and keyboard, an operating system [Raspian] on a SD card and have a computer up and running that comes with Minecraft pre-installed!? It certainly gave Jamie some ideas about building a lunchbox laptop with Retropie to take to school. 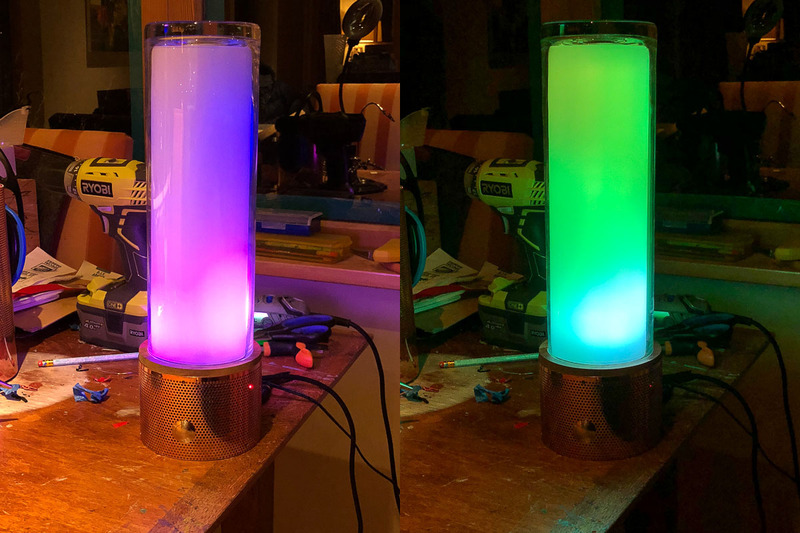 A couple of evenings tinkering around and I had the Raspberry Pi running my own lavalamp sketches completely standalone. You can see here also a hardware button and a green status LED connected to the GPIO pins. More on that later. You can also see what a cluttered mess my desk is. I'll cover the software side of this in the next post or two. But now that I had the Pi set up and knew how big it was I could start thinking about the base for the lamp. Oh hells yeah. A little steampunk maybe but, meh. Plus it had a nice patch of solid material at the bottom that could provide a nice two-panel appearance. 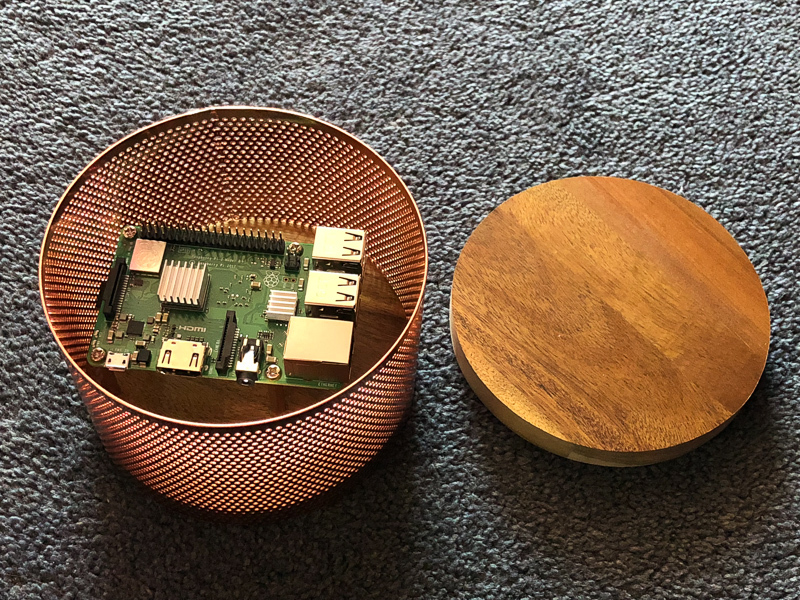 I brought with me the measurement of the diameter required to ensure the Raspberry Pi would fit inside laying flat, and it gave a little extra room which I'd need to accommodate the USB and power connections. Just how close that would come, I was soon to find out. 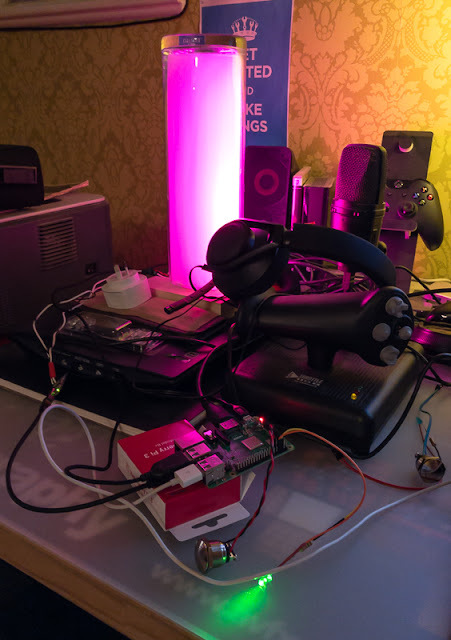 I was planning to run the Raspberry Pi in a headless fashion, so the HDMI and keyboard and mouse cables would not be required. I was connecting via wifi also, so no ethernet to consider. 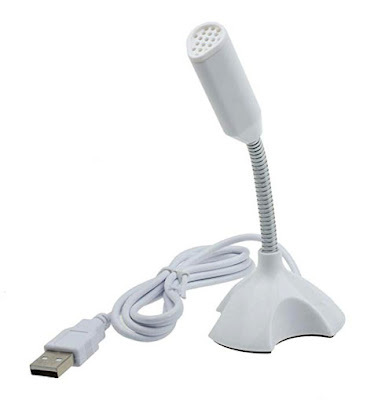 Just power, a USB-A or two for the Fadecandy and a mic perhaps? I found a cheap cheese platter board at a local homewares shop that gave me some nice dark hardwood that made an excellent base to mount the Pi onto, and also provided the wood effect I wanted for the glass vase/cover to stand on. I cut two circles out and sanded the edges to provide a snug fit into the cylinder mesh. 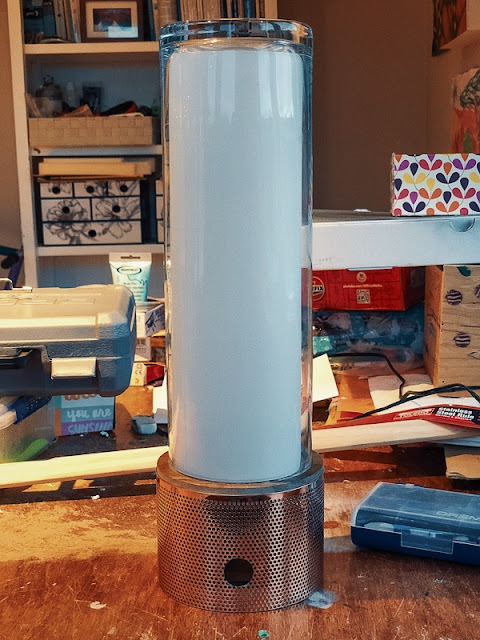 So I underestimated the amount of room the USB-A plugs would require to fit inside the mesh cylinder and had to embark upon some shroud-stripping and smallification. 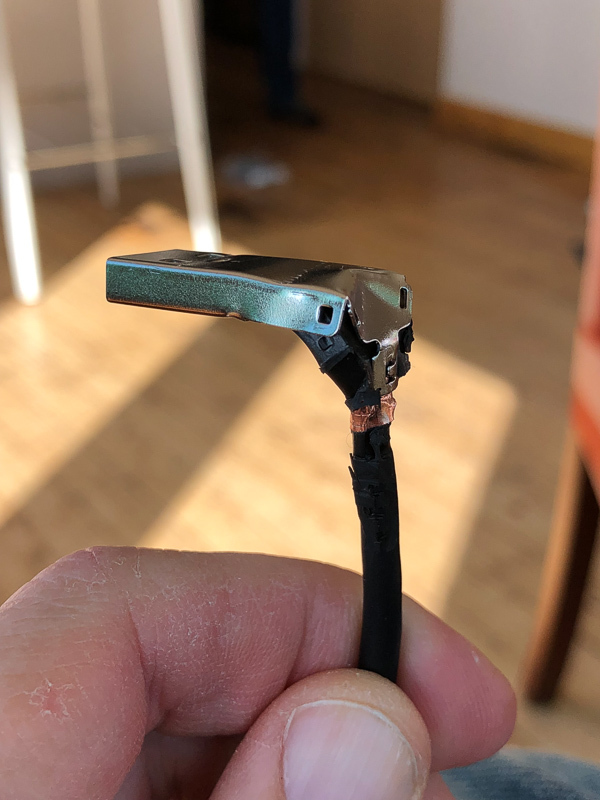 This might look a little dodgy but I'd really only exposed the ground wire and planned to heat shrink it anyways. It fits, and it works. Phew! I mounted the Pi up on some standoffs that'd give me some room to deal with cables and the Fadecandy board too. I countersunk the screws on the bottom so they wouldn't protrude. I planned to put some rubber feet on once it was complete. While I was working through this phase I also made decisions about buttons and lights. I'll detail more about this in the software section. I needed one button to switch the sketch that was running and another to start up and shut down the Pi. 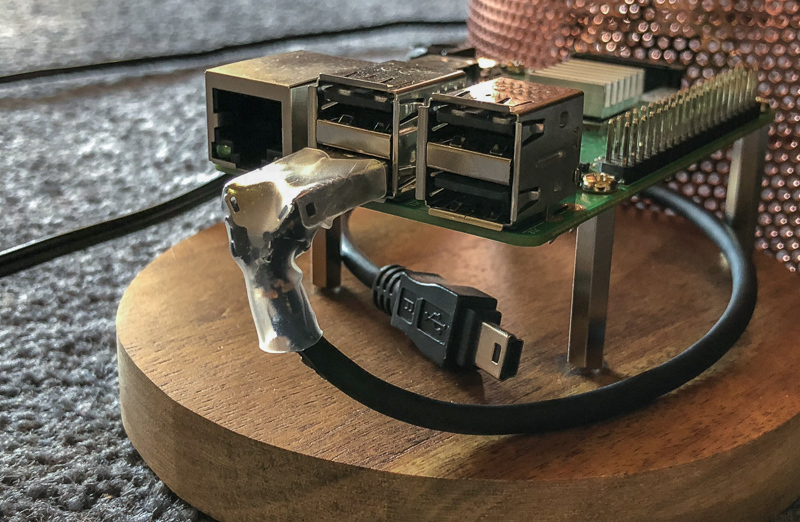 The Raspberry Pi is a complete Linux computer and Linux file systems can be corrupted if they lose power - so you simply cannot pull the plug reliably. You MUST shut them down nicely or deal with losing everything. 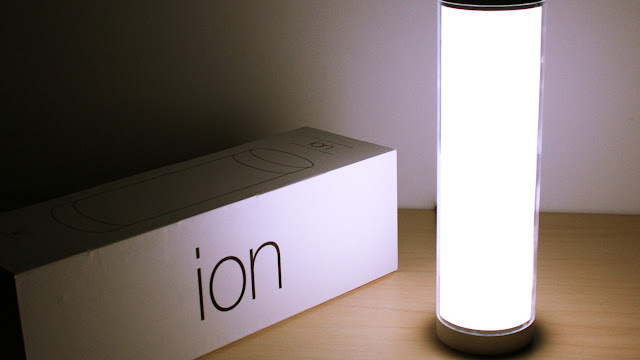 I also wanted a status light that I could use at a glance to know if the lamp was on, or ready to be safely switched off etc. All these buttons and lights connect to the GPIO pins on the Pi but needed to be wired up and placed during this part of the build. I decided to wire up both blue and green LED choices to see which I preferred. Although I liked the blue it was too piercing and I went with the green for a more old school look. Cutting the button holes went easily enough with a combination of cutting and sanding discs on the dremel. One button on the front for switching sketches and one on the back for startup and shutdown. I made the decision to go with two power cables to supply the lamp. This wasn't as neat as I hoped but I didn't feel brave enough to drive the Pi via the power supply I'd bought for the LEDs as their requirements at full-white might risk drawing too much juice and make the Pi brown-out. So I chose to live with running both the LED power cable AND the Pi 5.1v adapter supply together. 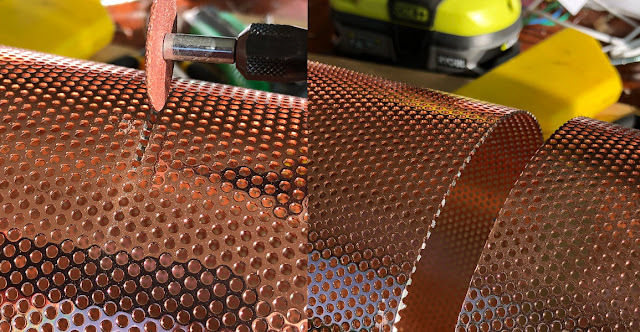 They needed to go into the side of the base at the rear but I didn't want them rubbing on the rough copper cuts I made. So I lined the edge of this hole with a hose washer I found at the hardware store that was the right size. 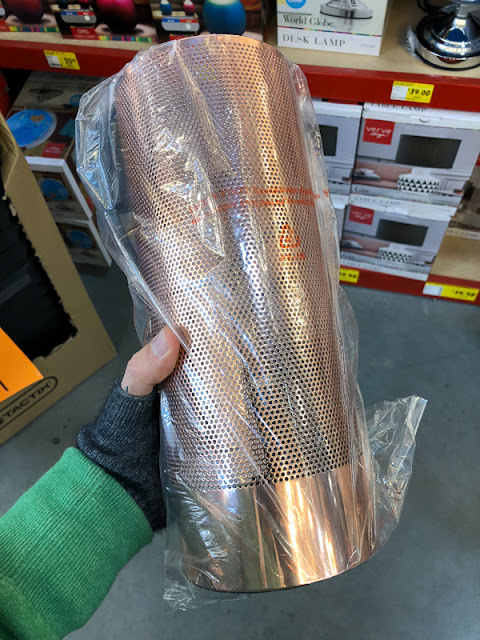 It's not exactly strain-relief but it'll stop any wires from being cut. 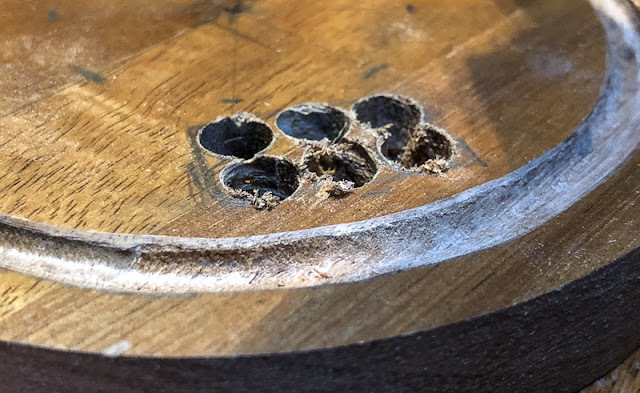 Also you can see where I slipped with the dremel and scratched the copper surface while cutting the power hole. D'oh! I cut a groove into the top wood disc to give the vase something to sit into and not fall off. I had a plan to secure this even better once it was complete. My first real look at the aesthetic direction. 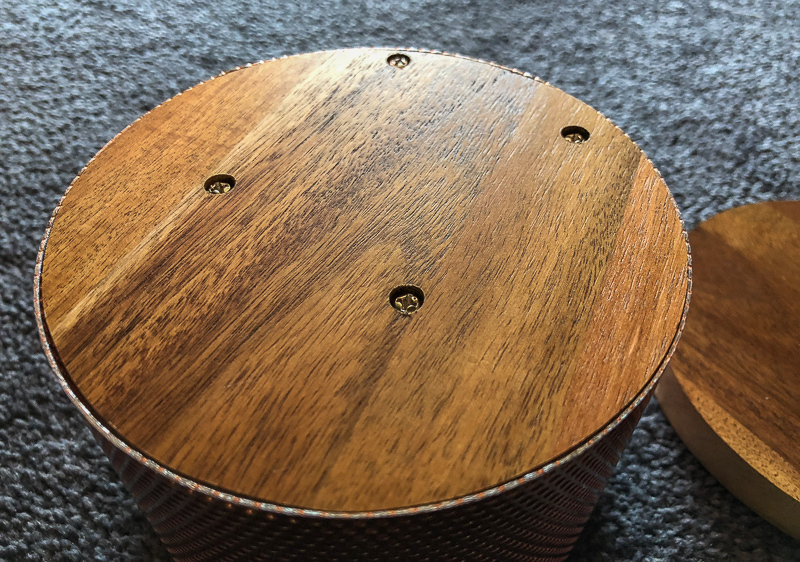 I moved onto mounting the central PVC cylinder covered in lights to the top wooden plate. 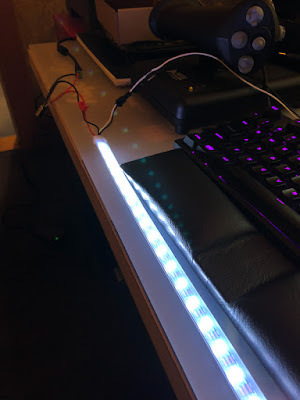 I needed something removable in case I needed to replace any LED strips or to fix busted solder connections etc. 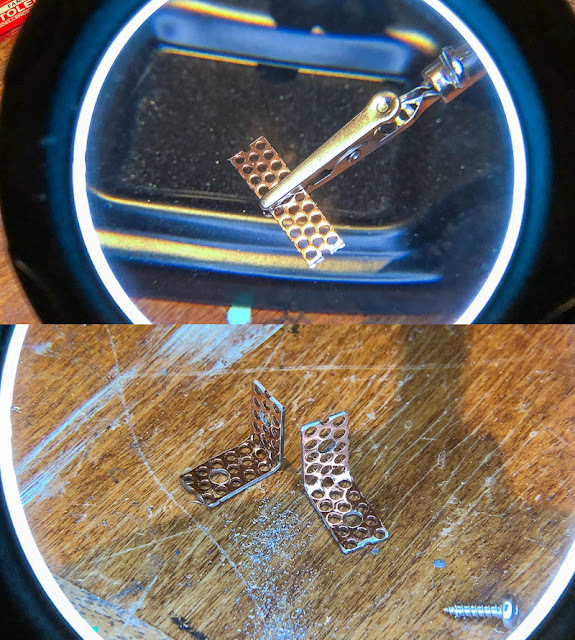 I used some of the remaining copper mesh and cut some bendable strips to make some right-angle brackets. 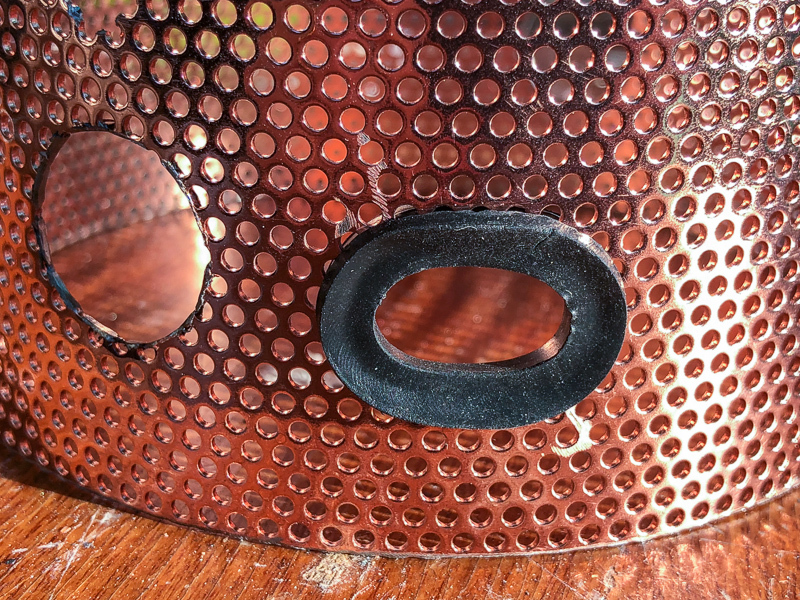 I drilled into some of the existing holes in the mesh to enlarge them just enough for the screws required. Now it was time to get all that wiring below deck. No-one is going to see it thanks to the diffuser material inside the vase cover but heck, I'm a neat-freak. I needed to cut a hole through the wood and get the power and data wiring for the LEDs down to the Pi and Fadecandy etc. It's ugly but it'll get cleaned up. It's all stacking up nicely. Diving back to the rest of the install for a mo, I took time to get the Fadecandy nestled happily underneath the Pi and shielded. I'd rationalised that the Pi would generate the most heat and as such bought two small heatsinks to place on the main CPU chipset. I didn't want the Fadecandy board above this and chose to seat it downstairs. During my sketch investigations I found a small USB microphone on Amazon that just plugged in and worked in Linux. 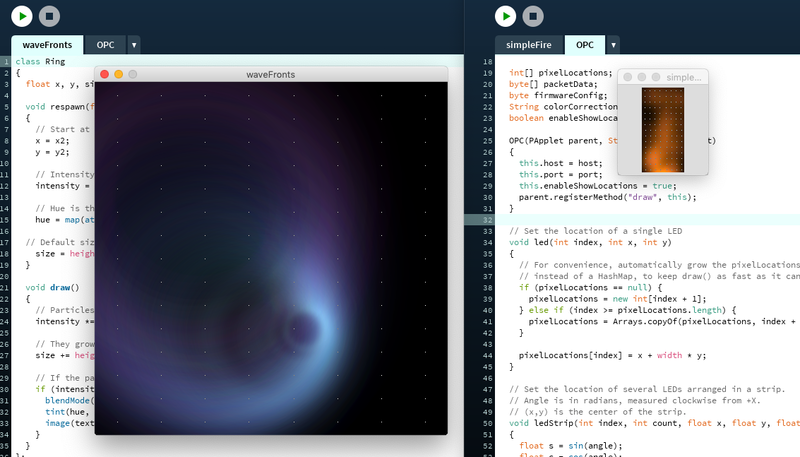 This meant that using a Processing library called Minim, I could modulate any parameter of a running sketch. So I could change the colour of the particles in my campfire sketch for example, just by monitoring sound in the environment. I decided to include this capability and make use of it later during the software phase. I just need the mic and USB stuff really. Not the flexible neck or casing. In taking it apart, I found it had a little logic board that I shrouded in transparent heat-shrink and placed underneath the Pi alongside the Fadecandy board - see the image above. Cling to the wall status LED. Just hang in there little buddy. The install was really coming together at this point. 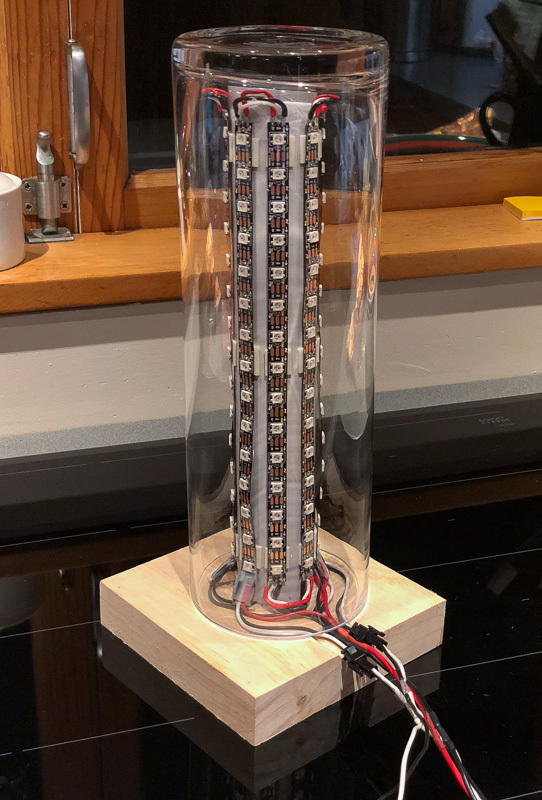 I still had to complete the pathing of the LED array power and data connections from the upper deck to the lower section, but in the meantime I installed the LED status light by simply bending the legs of the LED and foam taping it to the internal wall of the mesh cylinder. Not the neatest solution, but I didn't want to use glue or have to have another screw protruding through the mesh. Ok. I knew at some point I was going to have to disassemble this thing and troubleshoot it for some reason. Who knows why. Something will go wrong at some point. I wanted to make it easy to do that by simply being able to disconnect the upper floor from the lower. Having messed about with flying small quadcopters recently I decided to use some XT-60 connectors because they were both reliable and they also happily conducted a LOT of power. 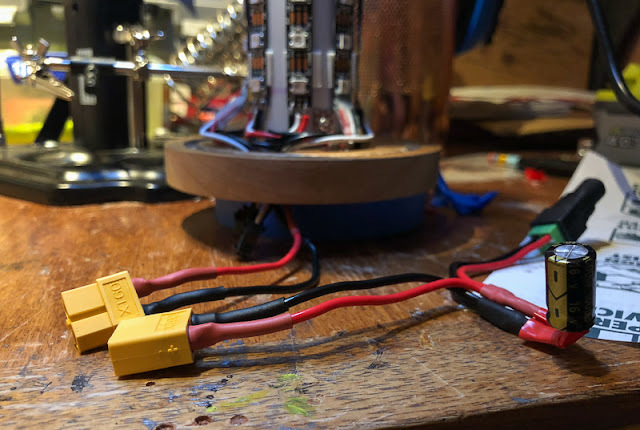 You can also see in the image above the capacitor I added to the incoming power connection to prevent any surges from frapping my LEDs. Powering it up on the bench. You can see the green status LED as well as the Pi board lights through the mesh. And then with the cover on all that remained was to drill holes for the screws to keep the top wooden platform in place just poking out of the mesh. That's if for the build and install. From here on it's mostly software and adding new capabilities. The next section will be all about the software side of things. I'll detail the tweaks and discoveries I made during my Raspbian setup as well as some Python for switching sketches based on pushing the front button etc. Also some Processing sketch discoveries. See you there. Part 3 is here now.